Well, since I’m still writing an episodic surreal detective story called “Liminal Rites” which is updated once a day (so far at least), I thought I’d offer some of my thoughts and advice about writing in this particular way – since it’s quite different to writing an “ordinary” story story, novella or novel in terms of the techniques and structure which you need to use. Ideally, you should probably have some experience with writing short stories (since it’s closer to writing these than it is to writing a novella/novel) before you attempt to write an episodic story. 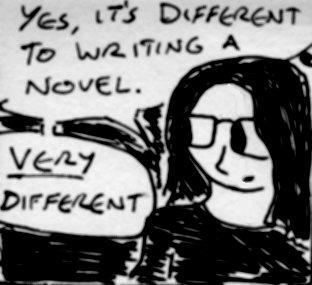 Seriously, if you’re just learning how to be a writer – then start with a type of fiction which is more forgiving and less intense than episodic stories. You have been warned. Apart from a seven part “CRIT” short story (“Episode Three – The Place of Dead Screens”) I wrote in January, I’m still reasonably new to writing serialised stories, so this article only reflects what I’ve learnt so far. Although I’ve covered some of these points in my article about series writing , I thought that it was about time that I focused specifically on writing episodic prose fiction rather than comics. Anyway, if you’re writing an episodic /serialised story – here are some things to bear in mind…. 1) Choose somewhere to publish it: In the 19th century and early-mid 20th century, serialised stories tended to be published regularly in magazines – these days they’re a of a lot less common. However, we have something that they didn’t – the internet. There are lots of places where you can post your story online – for starters, you can do what I did for “Liminal Rites” and set up a separate blog on WordPress for it. Of course, there are plenty of other free blogging sites you can use for your story too (eg: Blogspot and Livejournal). Likewise, although it’s primarily an art site, you can also upload fiction onto DeviantART too. If you’re feeling really adventurous or want to promote your story even more, it can be worth publishing it on multiple sites – or, if you have another blog, then you can feature the occasional chapter of your story on your other blog (like chapter two of “Liminal Rites” on this blog). 2) Make sure that you really like your story idea and make sure that it can go in many different directions: Firstly, you’re probably going to be working on this story for a while – so it’s extremely important to make sure that it’s an idea that you are really interested in and enthusiastic about (ideally something you can geek out about ). Trust me, there is nothing worse than losing interest in a story a few days after you’ve committed yourself to writing it. Firstly, it’s a good defence against writer’s block – if you’re on a schedule, then writer’s block can be an even more severe problem than it normally is. In fact, it can pretty much kill your serial if you’re not careful (yes, it’s a serial killer! Sorry, I couldn’t resist making that joke…). By coming up with a story idea which can go in all sorts of different directions, you can just switch to another plot idea if the one you were going to use just isn’t working out. Secondly, it makes your story less predictable. I’ll be dealing with this subject more later on in this article, but a good serialised story needs to be something that makes your readers curious enough to keep reading it every day or every week. If your story is fairly predictable, then people are less likely to keep reading it. 3) Write short chapters that end on a cliffhanger of some kind: Short chapters (ideally 500-1000 words) are important for both you and your readers – they’re important for you, since you will probably be writing quite regularly and churning out novel-length chapters (eg: 1000-3000 words) on a daily or weekly basis will probably get very exhausting very quickly. So, for the sake of time and your sanity – keep your chapters fairly short. As for your readers, if they’re reading something every day, then they might not have the time to read a full-length chapter. So, keeping your chapters short saves them time too and it might also make them eager to read more of the story too. Secondly, your chapters should end on a cliffhanger of some kind or other as often as possible. This is important, since it makes your readers curious about what will happen in the next chapter and it will (hopefully) keep them interested in your story. This doesn’t have to be something melodramatic – but it should be something that either raises a question (eg: chapter one of “Liminal Rites” ends with Claura receiving a mysterious scrap of paper and the chapter ends just before she reads what has been written on it) or makes your reader curious about what happens next (eg: if your chapter ends at a dramatic point in the middle of a conversation etc…). 4) Make a schedule and stick to it as much as possible: Regularity is very important for episodic stories – if your readers are interested in your story, then they will be following it closely and probably eagerly awaiting the next update. As such, it’s important that new chapters appear at regular intervals. It’s up to you how often you update your story – but you should set a regular schedule (eg: every day, every two days, every week etc…) which you feel that you are realistically able to follow. If you’re publishing your story on WordPress, then be sure to take full advantage of the “publish”/”schedule” feature [on the right-hand side of the “add new post” screen] which allows you to choose when your posts will be published on the site (at the moment, chapters of “Liminal Rites” are published daily at 22:30 GMT/ 23:30 BST). If you use this carefully, then you can have a couple of days worth of updates queued up in advance – this will take some of the pressure off of you when it comes to writing your story. I forgot to do this with “Liminal Rites“, but it’s usually a good idea to write the first couple of chapters in advance before you post the first one online, since this gives you a “buffer” of time which can come in handy if you get writer’s block or are busy. 5) Don’t worry if you have a bad day every now and then: If you’re writing something every day, then you’re not going to have the same luxury of time that you might have for an “ordinary” novel/novella/short story – so you might end up producing the occasional chapter which isn’t as good as the other chapters. Don’t worry about it, it happens to everyone. As long as your badly-written chapter keeps the story moving and you don’t produce too many of them, then it’s ok.
As I pointed out in the previous point on this list, regularity is the important thing with episodic/ serialised stories. Or, to put it another way, it’s better to upload a badly-written chapter on time than it is to not upload anything at all because you’re worried about how good or bad your next chapter is. Oh, in case anyone is interested – I’ve already had two badly-written chapters of “Liminal Rites” so far (chapters one and four). Seriously, it happens to everyone. This entry was posted in "Liminal Rites - A Surreal Detective Novel, Uncategorized, Writing and tagged episodic stories, how to, Liminal Rites, serial, serialised stories, writing. As a budding writer you really have given me something to think about. Just like you said write short, I also implement the proofreading method. But all of your methods are very helpful and I will be implementing them in my next session. I’m glad that my article was useful 🙂 And, yeah, I usually tend to prefer to write short things (on the rare occasions that I write fiction these days). But, yeah, proofreading is fairly important too – although unless you’re selling an e-book or publishing professionally, then I’ve found that using the spellcheck/grammar check feature on most word processors usually works fairly well for this (although it obviously can’t spot every type of error, so it can also be good to either have a friend look over your story or to wait a few days and then take another look at your story). Eagerly waiting 2 hear from u!! Ah, I thought that I’d already replied to your original comment a couple of days ago. Although, if you’re asking about proofreading services, then I’m not really interested at the moment. Sorry about this, but thanks for the offer.